When working with vegetables, the most annoying thing is peeling and then chopping them. This becomes more difficult when working with onions because they stimulate your tear ducts. However, you can avoid all this trouble if you have the best vegetable chopper in your kitchen. When you hear the word chopper, you would initially think of electric choppers used for mincing meat. The fact is that you can find manual choppers for chopping, slicing, and dicing vegetables, fruits, nuts, and more. They have sharp blades that quickly cut ingredients into tiny pieces, saving you time and effort. Also, depending on the brand, model, and design, the mechanism may vary. Some are best suited for chopping vegetables for salad and salsa, while others can be used to prepare vegetables for all kinds of dishes. With such usefulness, it is apparent that you will start looking for one that will match your needs and wants. To help you find the right one, we have reviewed three vegetable choppers. Here are three carefully selected vegetable choppers that are all great at what they do. Let’s look at their features and how it can benefit you in the kitchen. The Vidalia Chop Wizard is a simple and efficient chopper. It consists of a container with a moving lid, and there are two highly sharp insert discs. One is for smaller pieces (1/8th-inch squares) and one for larger pieces (1/4th-inch squares). The blades are made from stainless steel and should last longer than others. From soft vegetables like cabbage to harder ones like potatoes or carrots, any vegetable for that matter can be diced with this chopper. Similarly, you can cut fruits and cheese with this chopper. The mechanism is simple as you just need to place the vegetable on the disc and press the lid, and then the product gets chopped into the container. The catch container is also marked with half a cup and two cups to allow you to cut vegetables precisely according to your needs. Another feature of the Vidalia Chop Wizard that is worth mentioning is that it just weighs 0.32 ounces. Likewise, it takes very minimal space on the kitchen counter, as the dimensions are 11.9 inches from top to bottom and 10.5 inches from side to side. Lastly, cleaning this chopper should be a breeze thanks to the lid cleaning tool provided with the chopper. The Brieftons Manual Food Chopper can be used to chop vegetables, herbs, fruits, and even nuts. It is a bowl-shaped chopper that comes in two sizes that include two-cup and four-cup. Additionally, the plastic used for the construction of this chopper is BPA-free, making it safe for food items. Another great thing about Brieftons Manual Food Chopper is that not only does it chop the vegetables, it can also mix them pretty well. 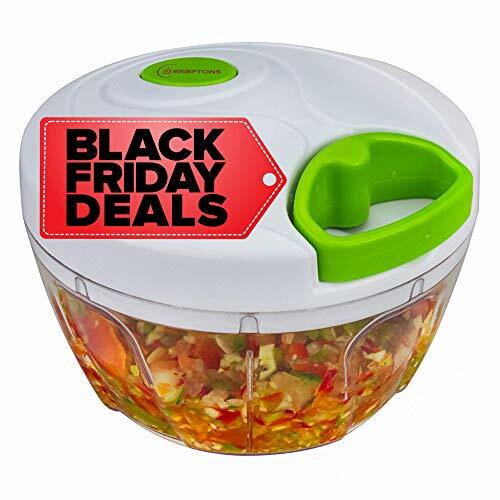 This makes it ideal for making salads and salsa. The chopper works using a cord coil mechanism, which means that when the elastic cord on the lid is pulled, the blade rotates to chop the vegetables. Interestingly, the sharp blades are hidden during use to make it safe. It is also super easy to clean since all you need to do is wash the bowl. Brieftons is a trusted kitchen appliance company that offers a money-back guarantee on all of its products, including this chopper. Apart from that, you’ll also receive an eBook that contains recipes for salsa and salads. 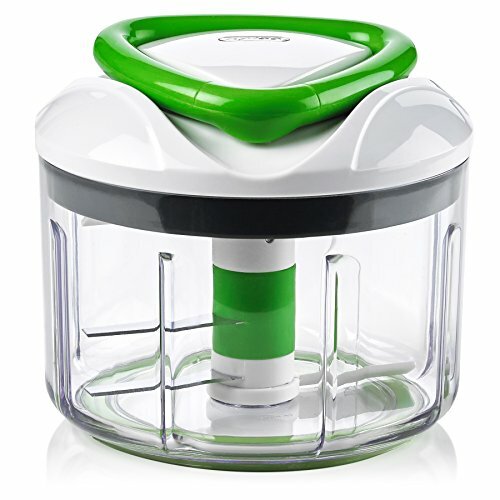 The ZYLISS Easy Pull Food Chopper and Manual Food Processor is a product that can be used for chopping, blending, and pureeing. It has multiple blades and a fairly large-capacity bowl. To be specific, the glass has a total capacity of 25 ounces, so it can roughly make three cups of whatever you are working on. Its two sharp blades rotate to chop the entire contents of the bowl. Since it has a pull-cord mechanism, using it will not be much of a hassle. To add more, the ergonomic handle of the cord is comfortable to hold and pull. There are also two booster arms on the top and the bottom. They keep the contents from sticking to the surfaces. On the other hand, the pull string is made of high-quality materials, so you do not have to worry about it breaking or pulling all the way through. It is also top-rack dishwasher safe, making it easy to clean after every use. ZYLISS stands by the quality of this vegetable chopper that is why it comes with a five-year guarantee. Should anything go wrong, you can have it replaced or even get your money back. In terms of quality, all products meet the standards–the blades are all made of stainless steel and durable. All of the three are portable as well and suitable for domestic kitchens. That said, which one works best for you may boil down to your specific needs. If you are looking for convenience as well as efficiency, then the Brieftons Manual Food Chopper is the best vegetable chopper for you. It works smoothly, does not create any mess, and has no noise, unlike electric choppers. The ZYLISS vegetable chopper is a bit bigger in size, especially when compared with the Vidalia Chop Wizard. Thus, it is perfect for those who need to prepare dishes for a large number of people regularly. 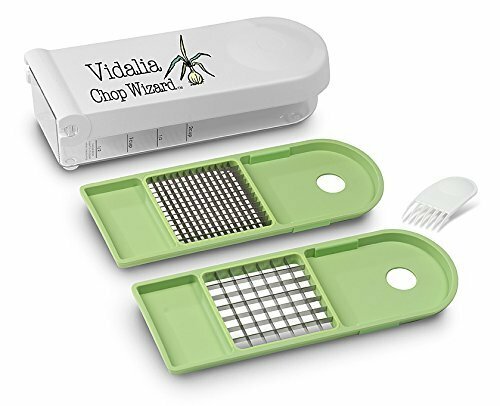 The Vidalia Chop Wizard is a lot more convenient to use as all you need to do is press the vegetable through the blade insert. Another quality of the Vidalia Chop Wizard is that it chops evenly and consistently, while the other two work by the pull-string mechanism and may produce uneven dices of vegetables and fruits. Hence, for us, this is the overall winner!